The week ended with the yearly commemoration of All Saints’ Day. To just about everyone in our largely Christian country, November 1 has always been reserved for the remembrance of lost love ones. It usually meant bringing the most beautiful flowers one can possibly get for them. I had white ones for Mariel because she had told me once before that she had specially liked them for these occasions. The special day however had made a few more thoughts cross my mind. For one, it had reminded me ever so viscerally that in a few days, Mariel’s and my birthday shall be coming. I’m still very much saddened by these expected anniversaries and celebrations, simply because Mariel and I had always given them a lot of importance and seriousness . I know nevertheless that I must do my best to see them in a slightly different light now. As I even try to start new ways of keeping the memories alive. It’s easier said than done though when your loved one’s not there to make it worth celebrating. However, I must strive just the same because I know Mariel would’ve bravely breezed through these times. Her grave site looks beautiful! I love the glow of those candles. I’m thinking of you all, especially as the holiday season approaches. You do so well in keeping the memories alive. I wish you strength and peace. Take care too, we are doing our best to carry on. Still some way to go but we know Mariel’s never really further than a heartbeat away. 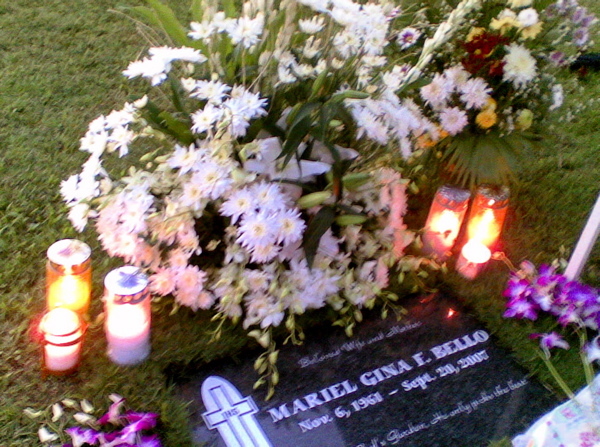 Thank you for loving Mariel so much. You two are truly a match made in heaven. Few people are lucky enough to have this kind of love… you are blessed. It’s so heartwarming to read your innermost feelings about her. I’m sure she is at this moment surrounded with angels… smiling down on you and loving you even more. Advance Happy Birthday to my beloved cousin Mariel. And Advance Happy Birthday to her beloved husband Bong. Thanks too for the good wishes. It is not hard loving Mariel simply because she had given so much of herself without expecting anything in return. She continues to be a big part of my life each day specially now that I must keep on for our beloved daughter Samantha. Have a great one too on your birthday next week. Warm regards to Zave and your beautiful children. Such beautiful flowers in the garden today – Mariel will be smiling. keep up the good work Bong – you are doing a wonderful job with Sam, and anniversaries and coping. Take care dear friend. Thinking of you. Thanks Jan as always. Sending you all our beautiful thoughts from the garden.